This week I am featuring Hope from Invisible Mother. Hi, I'm Hope and my blog is Invisible Mother. 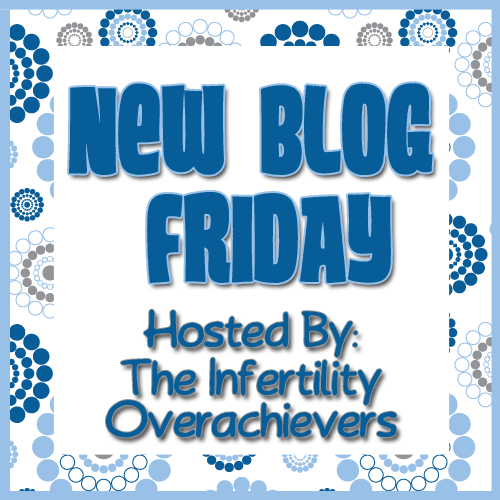 First, I am tickled to be featured on New Blog Friday, although I feel like a bit of an impostor, since my blog's not quite so new anymore. It was still fairly new back in April when I e-mailed Aly, asking to be featured, but even though I passed my one year blogoversary while New Blog Friday was on hiatus, Aly said it was still okay for me to be featured here. What a generous lady! Anyway, about me. I'm in my late 20's and happily married. About 6 months after our wedding, my DH and I started TTC. I immediately went on to have 2 very early miscarriages. I started this blog a few months later as a place to document my grieving process and finding my way through grief. Over the past year, it has become a place where I document everything about Recurrent Pregnancy Loss, from grief to hope, from testing through treatment, from one specialist to the next. In November of last year, I had just seen my first fertility doctor, gotten a diagnosis or three, and was hopeful that our next pregnancy would result in a baby. Instead, I continued to miscarry. I've now had a total of five very early miscarriages. Further testing over the past 6 months has revealed more problems. All of them are treatable, but that doesn't meant there aren't more issues still to be discovered . . . For a rundown of what these issues are, and what's being done about them, check out my Tests and Treatments page. Outside of IF/RPL I'm a volunteer with my church as a Sunday School Teacher and the Children's Choir Director. That sounds like a lot more work than it is. I'm one of a team of 5 Sunday School Teachers for the 3rd-5th grade class, which can have up to about 12 kids, but often has less. The team rotates, so I teach and/or assist a couple times each month. The Children's Choir consists of 6 kids who like to sing. I'm also a volunteer music teacher at a local public school. This year I'm teaching two Kindergarten classes, and it's lots of fun. The other thing I keep busy with is cooking. I've discovered that I feel much healthier on a low glycemic index (GI), gluten- and dairy-free (GF and DF) diet, so that's what I'm following right now. Which means I pretty much cook all my meals at home. From scratch. Yeah. It's a 20 hour/week job. I've just discovered breakfast beans (yummy and filling). I've also just whipped up a batch of high-protein, low GI biscuits. I'll be putting up a couple more recipe posts soon. For past recipes, check out Hope's Kitchen. Go show Hope some blog love by commenting and/or following. I value your important and informative point of view here. You have written this article so nice and informative. Thanks for sharing your time and effort.